I know it might be hard to concentrate on Christmas cards when the temps outside are this high, but with all the amazing Christmas dies you will find at Dies R Us, this is the perfect time to get a jump start on them before all your favorite dies are gone! The selection right now is amazing & growing every day. I gathered 4 of my favorite dies for today's card: Frantic Stamper Evergreen Forest Edger, Lawn Fawn Large Stitched Oval Stackables, Impression Obsession Pine Cone & Fir Branches, and Impression Obsession Deer Trio. At the present time, the deer die, pine cone and forest edger are out of stock, but if you don't already have some of these dies, just go the the store & type in "deer" and you will find 27 to choose from. Typing in "pine cone" will give you 11 and "forest" will give you 5 borders! You may actually find you like some of those better than the ones I chose! And remember, you can always put your name on our waiting list and be emailed when dies come back in too! I do it all the time! 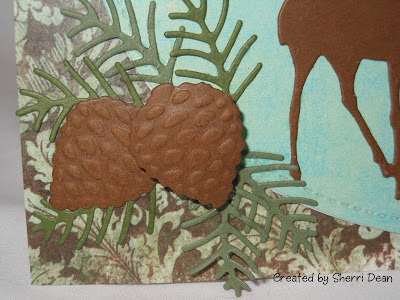 Below is a closeup of the beautiful embossing you get with the pine cone die! I popped the top one up with a foam dot for even more dimension. 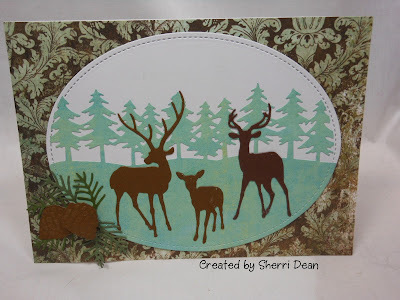 Don't forget to visit our Dies R Us Challenge Blog! New challenges begin on the first & fifteenth of every month and you could be the lucky winner of a gift certificate to the amazing store! Have a fantastic week and I will see you next Wednesday! Beautiful......I used those pine cones the other day and did them in a deep dark green Co'ordination paper then filed off the green so the brown showed through - they looked great!